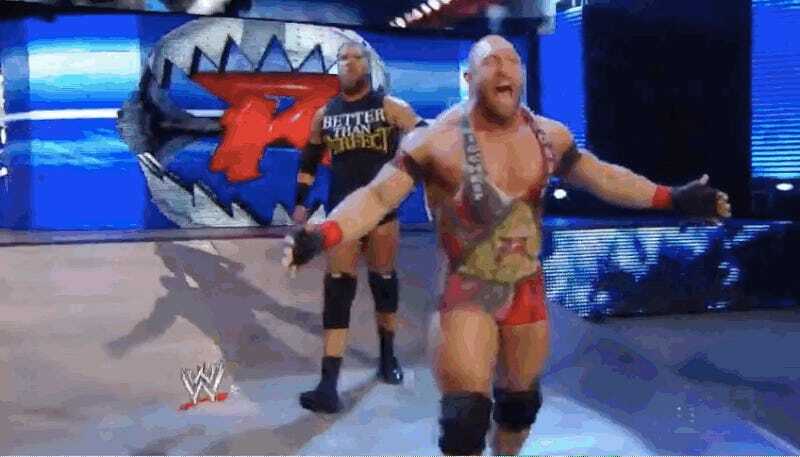 Ryback (right) making his entrance. Via WWE Network. WWE wrestler Ryback (real name Ryan Reeves) wrote a Tumblr post today where he disclosed that he’s asked to be left off of the company’s programming until he gets a new contract. Reeves—a mid-card wrestler who acknowledges that at this point in his career his job is to make other talent look good—questioned why the winners and losers get paid differently, when the matches are planned out beforehand. I was beat up, and I was torn up, and then John Cena got hurt, and they were like, “Well, how do you feel about [Ryback]? He’s definitely not ready, but you can carry him if you want.” I was like, “Yeah, okay, great.” So, that took 20 years off my life. I’m already beat up and I have to wrestle Steroid Guy—I call it like I see it—he’s very hurty. Sometimes deliberate. There was one time he kicked me in the stomach as hard as he could and he broke my ribs right at the tail end. I never got an apology for that. He was something else. Real piece of work, that guy. Reeves denied Brooks’s accusations at the time.